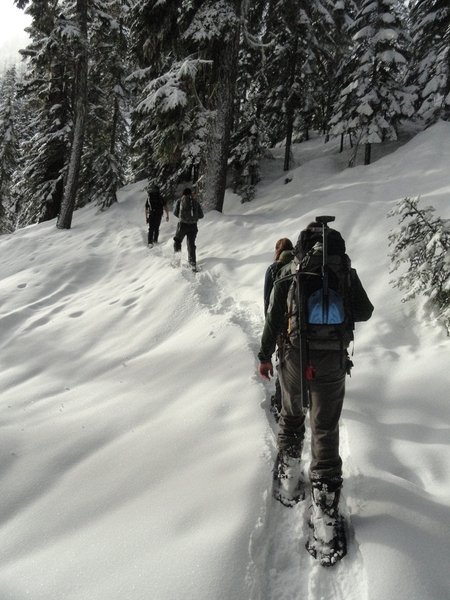 If the recent snowfall in Seattle has you lusting for more frigid adventures, grab your ice ax and snowshoes for a trek up Guye Peak. This scenic portion of the Pacific Crest Trail is blanketed in rich powder and adorned with impressive ice formations, offering snowshoers a veritable winter wonderland—complete with stunning 360-degree views at the summit. 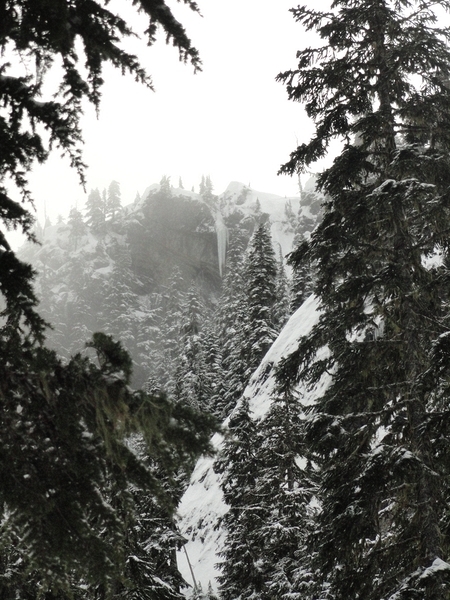 Located just off I-90 near popular Snoqualmie Pass, the route is often surprisingly deserted, providing ample opportunity to enjoy the serene winter landscape. Because the PCT parking lot is currently buried under snow, your adventure will begin at the Snoqualmie Pass parking lot. Keep your snowshoes off for this brief initial jaunt along the road and under the I-90 overpass. 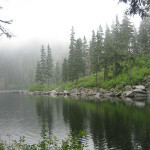 You will reach the parking lot and a sign for the Pacific Crest Trail in just a moment. From here, you will need all of your winter gear as you take the left fork from the parking lot and begin a gradual ascent through frosted evergreens. 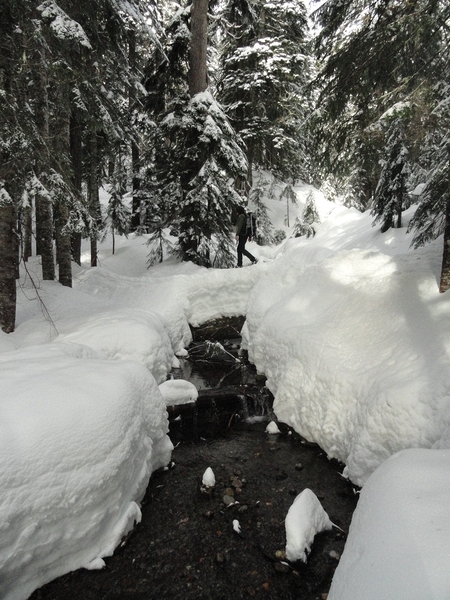 After about 1 mile, you will cross the first of two branches of Commonwealth Creek, on a wide, snow-covered log. You will bend slightly right to follow the creek, then turn left to cross another branch of Commonwealth in about 0.3 miles. After the second stream crossing, you will begin to ascend in earnest. 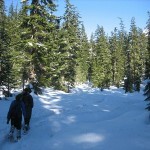 The trail zigzags uphill through Douglas fir and cedar on tight switchbacks before reaching a brief, level plane. 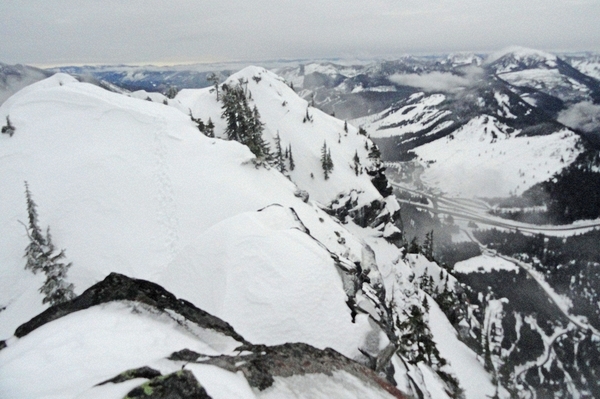 Here you can enjoy expansive views of the Snoqualmie ski slopes and many snow-draped peaks. Once you have soaked in this stunning panorama, continue uphill to the left—the rocky outcrop jutting from the forest is your goal. The climb reaches its steepest pitch here, rendering an ice ax and kick-stepping necessary at times. Make sure to gradually bend right as you ascend in order to skirt a large rock face, then to reach the true summit, tucked amidst a couple of other rocky outcrops. This narrow, 5,168-foot pinnacle offers stunning, 360-degree views of the rugged peaks of the Alpine Lakes Wilderness, adorned with snow and gem-like lakes. You might also catch a glimpse of ant-like forms zooming down the nearest ski slopes—an exhilarating reminder of the elevation you have gained. I-90 East from Seattle: 1. Travel east on I-90. 2. Take Exit 52 for Snoqualmie Pass West. 3. Follow the signs to the Snoqualmie Pass parking lot. The trailhead is located on the other side of the I-90 overpass, but the actual parking lot is currently under several feet of snow.